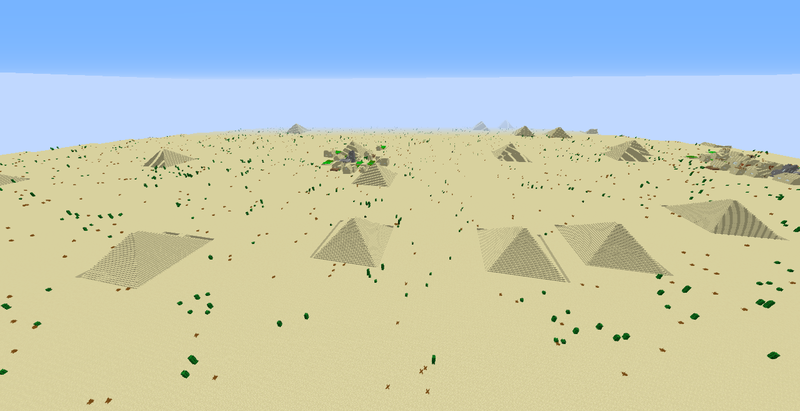 Here you can see the pyramids added by the mod. 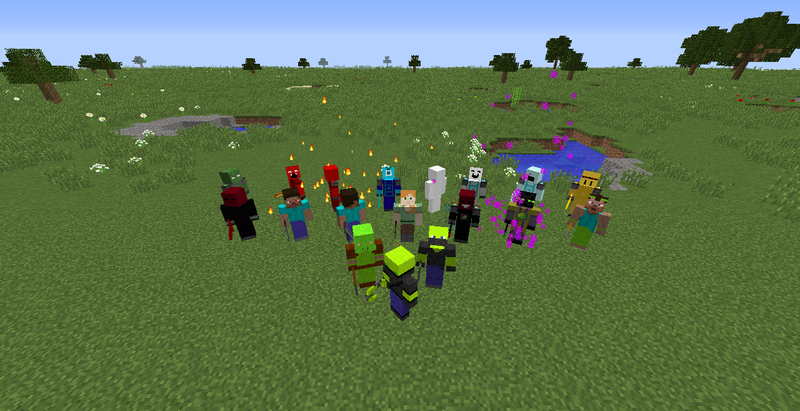 All mobs of the mod. A mod created by Maxpingouin. This mod is for you ! BONUS MAPS ARE COMING SOON TO PLAY WITH THE MOD ! 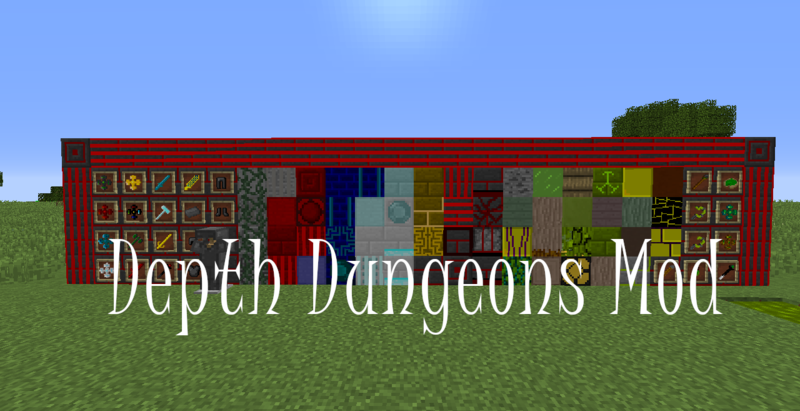 Depth Dungeons Mod adds a lot of items , blocks , mobs and structures that makes you Minecraft adventure better. -Dungeon Amulet - Heal you when you right click with it in the hand.Infinite uses and very useful. -Fire Dungeon Amulet - Sets the block you are on in fire and change the block you looks (small radius) into fire when you right click with it in the hand.Infinite uses but not op. -Water Dungeon Amulet - Gives you Night Vision and Water Breathing for 3 seconds when you right click with it in the hand.Infinite uses but not op. -Ice Dungeon Amulet - Summons a snow golem at your location when you right click with it in the hand.Infinite uses but not op. -Power Dungeon Amulet - Gives you speed III , strength III and Glowing III during 3 seconds when you right click with it in the hand.Infinite uses but not op. -The Woodamulet - Gives you luck during 13 seconds when you right click with it in the hand.Infinite uses but not op. -The Acid Dungeon Amulet - Spawn an XP orb when you right click with it in the hand.Infinite uses. -The Megamulet [Key Item] - Allows you to summon the Demon when you right click his prison with it in the hand.Create it with the amulet Merger. -Pharaoh Sword - Hidden the pyramids in the desert.Deals 10 damage points. -The Dungeon Boss' Waraxe - Hidden in a chest in the Demon's Dungeon.Obtainable with /give.Deals 12 damage points. -The Fire Dungeon Boss' Sword - Hidden in a chest in the Demon's Dungeon.Obtainable with /give.Deals 12 damage points. -The Water Dungeon Boss' Power Spike - Hidden in a chest in the Demon's Dungeon.Obtainable with /give.Deals 13 damage points. -The Ice Dungeon Boss' War Hammer - Hidden in a chest in the Demon's Dungeon.Obtainable with /give.Deals 14 damage points. -The Power Dungeon Boss' Sword - Hidden in a chest in the Demon's Dungeon.Obtainable with /give.Deals 20 damage points. -Spear - A cheap but fragile weapon.Deals 6 damage points. -Master Spear - A good weapon.Deals 10 damage points. -Kjaknaz - A powerful weapon sometimes dropped by the acid warriors.Deals 16 damage points. -Khjan - A powerful weapon sometimes dropped by Kjran.Deals 20 damage points. -The Dungeon Wand [Key Item] - The best item and the final goal of the mod.Deals 48 damage points.Right click with it in the hand to open an interface that allows you to instant build dungeons,heal you and allow/don't allow you to fly.Warning,you take fall damage when you touch the ground after flying.Obtain it by killing the Demon,the final boss. -The Crea Wand [Key Item] - An awesome item and the bonus goal of the mod.Deals 98 damage points.Right click with it in the hand to open an interface that allows you to change your gamemode[Do not work for now but will be fixed in futur updates].Obtain it by killing "Max",the secret boss. -Dungeonium ingot - Allows you to craft a powerful armor.obtainable by "cooking" dungeonium ore in a furnace. -Woodon Fruit - A fruit findable in the Woodian Forests.Full 2,5 Chicken Legs when eated.Always eatable.Gives speed when eated. -Woodon Pie - FULL THE FOOD BAR.Always eatable.Gives speed when eated. -Dungeonium Armor - Each armor part have 6 protect points. 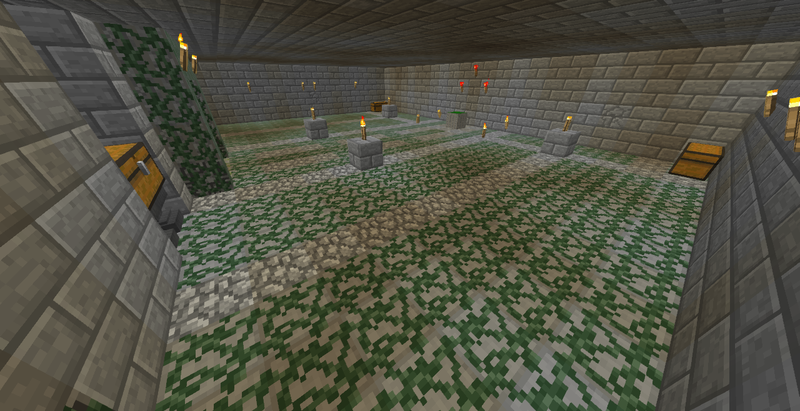 -Woodian Forest - Woodian warriors and giant zombies spawns here.Has tall trees. -Acid Biome - Has small trees and snow.All type of zombies except giants and husk spawn here. -Dungeon Boss Summoning Altar - Summons the Dungeon Boss when rightclicked and if difficulty isn't peaceful. -Fire Dungeon Boss Summoning Altar - Summons the Fire Dungeon Boss when rightclicked and if difficulty isn't peaceful. -Water Dungeon Boss Summoning Altar - Summons the Water Dungeon Boss when rightclicked and if difficulty isn't peaceful. -Ice Dungeon Boss Summoning Altar - Summons the Ice Dungeon Boss when rightclicked and if difficulty isn't peaceful. -Power Dungeon Boss Summoning Altar - Summons the Power Dungeon Boss when rightclicked and if difficulty isn't peaceful. -The Demon's Prison - unbreakable , summons The Demon if you rightclick it with the Megamulet in the hand and if the difficulty isn't peaceful. -Amulet Merger [Key Block] - Allows you to create the Megamulet by merging all the amulets. Remember there is a How To Play , a Upcoming Updates and a Q&A on the mod topic. 2-Go at the top of this page and click on "Download". 3-Select the version of the mod you want and click on it to download it. 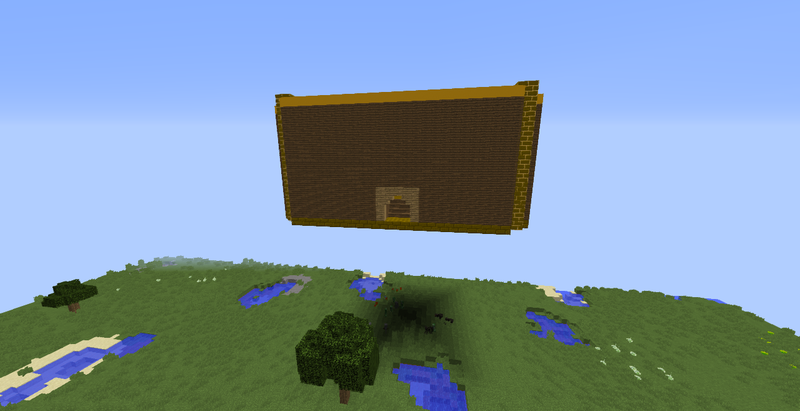 4-Go on %appdata%>Roaming>.Minecraft>mods on your computer and put the mod into the folder. 5-Launch your Minecraft with forge 1.12.2. Warning:If you want to put this mod in a modpack you need to ask it's creator (Maxpingouin) before adding it to a modpack. More updates are coming soon ! You can come to see every week if any update was realesed. 08/03/2019(France):MOTW ! Thanks you so much ! Maybe MOTW or DOTW coming soon ! Thanks for seeing this mod. Don't forget to download it , to try it and to comment. I hope this mod will improve your adventure. Alpha:First Dungeon added , non playable due to some errors like unworking achievements or no air blocks in the dungeons.No end. Beta:More Dungeons added , non playable due to some errors like like unworking achievements or no air blocks in the dungeons.No end. 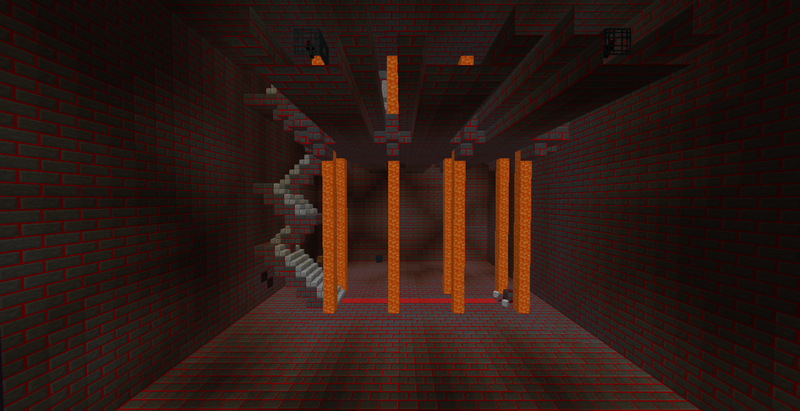 First "Stable" Version: More dungeons and end added but non playable due to unworking achievements. Real "Stable" Version: Unworking achievements deleted , playable , dungeons spawn number decreased and Dungeonite added.Mod page on Mcreator added the same day. First Real update : Secret , Wood and Acid Dungeons added. Nice mod :) Great mod page. There are no cooldown or limit simply because I don't know how to add one.At the start my objective was that the amulets have max 10 uses , but cause of a glitch (fixed in 1.8.2 mcreator) , the amulets didn't breaks after. The bosses can make you huge damage and sometimes you die because you don't have the time to use the amulets. I don't like that too but I can't change it because I am bad in Mcreator procedures. WHY IS THIS NOT MOD OF THE WEEK ?!? !